I am very happy to be able to introduce to you Rahraw Omarzad who will talk to you about his insight views of the arts & politics and his activities in Kabul, Afghanistan. He also has some videos with him that we can watch and discuss. Rahraw Omarzad was born in Kabul and he is a protagonist in the arts and culture of Afghanistan. Several institutions and organisation would not have come alive without his initiative and support. Already in his early years he started a career as an artist and was teaching in the fields of arts and sign language for deaf people. 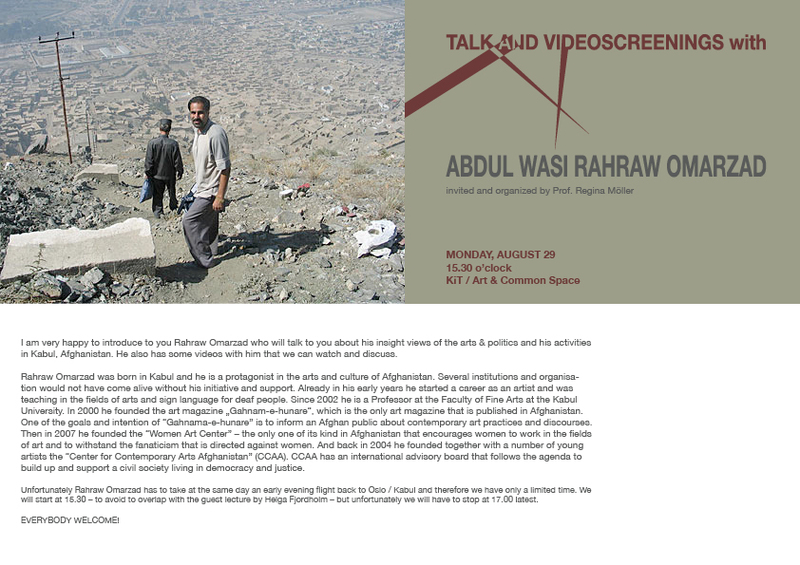 Since 2002 he is a Professor at the Faculty of Fine Arts at the Kabul University. In 2000 he founded the art magazine „Gahnam-e-hunare“, which is the only art magazine that is published in Afghanistan. One of the goals and intention of “Gahnama-e-hunare” is to inform an Afghan public about contemporary art practices and discourses. Then in 2007 he founded the “Women Art Center” – the only one of its kind in Afghanistan that encourages women to work in the fields of art and to withstand the fanaticism that is directed against women. And back in 2004 he founded together with a number of young artists the “Center for Contemporary Arts Afghanistan” (CCAA). CCAA has an international advisory board that follows the agenda to build up and support a civil society living in democracy and justice. Unfortunately Rahraw Omarzad has to take at the same day an early evening flight back to Oslo / Kabul and therefore we have only a limited time. We will start at 15.30 – to avoid to overlap with the guest lecture by Helga Fjordholm – but unfortunately we will have to stop at 17.00 latest.